I read this article and found it very interesting, thought it might be something for you. 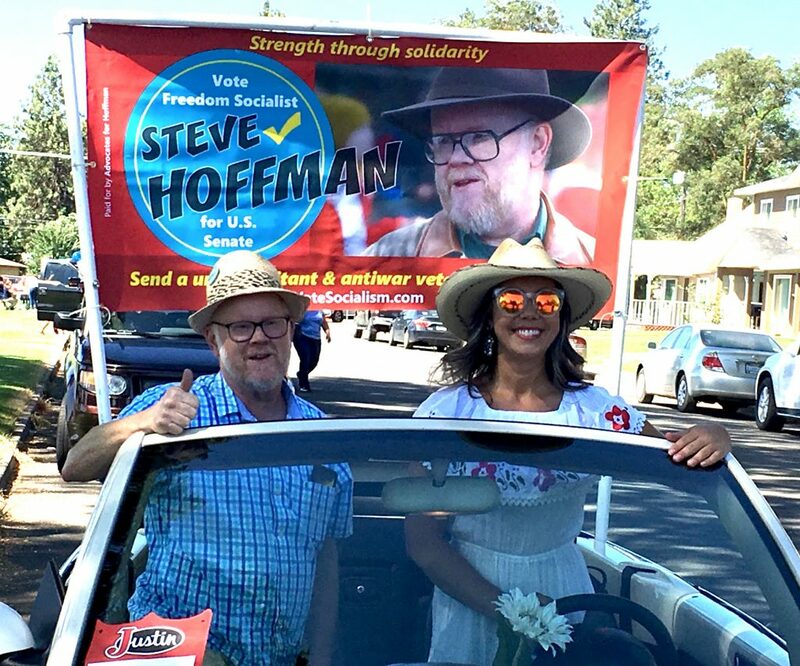 The article is called Publicity for Steve’s campaign, plus it’s off to the rodeo and is located at https://votesocialism.com/publicity-for-steves-campaign-plus-its-off-to-the-rodeo/. Friday morning’s Seattle Times arrived at our house with a prominent story on the fascist group the Proud Boys (“Rallying around Trump, the Proud Boys raise their Pacific Northwest profile”) and their friends, Joey Gibson and Patriot Prayer. The article begins with a horror story of these bullies attacking an African-American teenager but does not include anything about those who stand up to them. Steve Hoffman is the one U.S. Senate candidate with a long track record of countering this abominable racist scapegoating. The campaign team fired off a letter to the reporter on the story explaining why the Times needs to interview Steve. Letters to the editor requesting the same would be helpful. Email them to letters@seattletimes.com and let them know you want coverage of the Hoffman campaign. Meanwhile, we got press outside of Seattle. • Olympia’s Works in Progress reprinted Steve’s opposition to on the VA MISSION Act, “Congress Abandons Vets Just Before Memorial Day,” in their July issue. Senator Cantwell did not respond. Neither did Joey Gibson. Click hereto read the responses from the candidates who did respond. • The city of Auburn is producing a Video Voter Guide. Steve recorded his two-minute statement this week that we’ll share when the guide is live. • Socialist Action, based out of the Bay Area and with branches around the country, has endorsed Steve’s campaign! 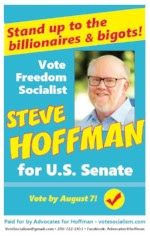 They are also running a candidate for U.S. Senate in Connecticut, Fred “Mitch” Linck.The Freedom Socialist Party is happy to endorse Fred’s campaign. Like Steve, he’s also an anti-war vet who knows the capitalist system is rotten to the core and needs a socialist overhaul. Watch Fred’s talk “Why I am running for U.S. Senator from Connecticut”. Follow his Facebook page: www.facebook.com/VoteSocialistAction/. Interestingly, Linck is required to gather over 15,000 signatures of Connecticut voters before securing a spot on the ballot. Quite a bit more than the 1,740 we had to gather. • Steve and about 20 other candidates participated in a forum with the Issaquah Chamber of Commerce this week. 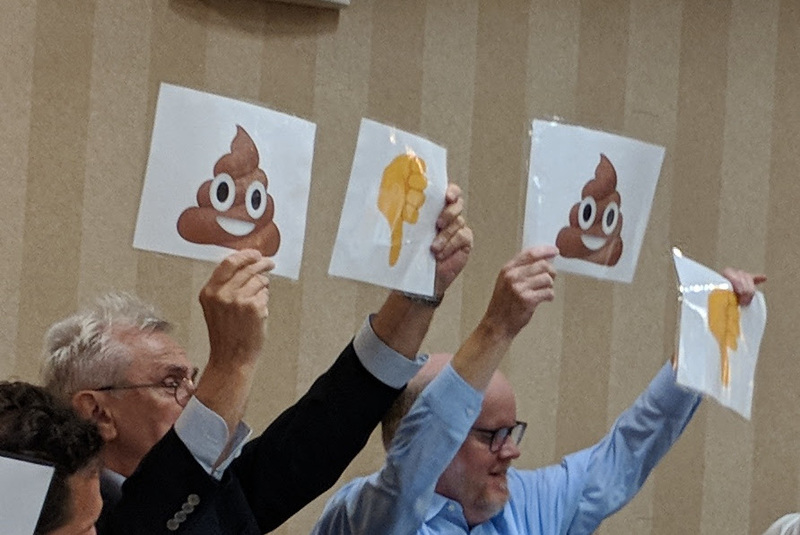 During one half of the forum, candidates were asked to respond to yes/no questions with emoji cards. When asked if they supported Trump’s border wall, both Steve and fellow U.S. Senate candidate Dave Strider displayed the thumbs down and the poop emoji. • This week both voter guides and ballots will be mailed by county election offices. Are you a selfie taker? Take one with your ballot and share! Sunday will be spent campaigning with friends in Spokane. Monday they will explore the Tri-Cities area. After that, Steve will participate in the Washington State Labor Council Convention in Wenatchee. This week we are continuing to get out campaign materials (postcards and brochures) plus plastering neighborhoods with our vibrant poster. You can download a pdf here and print your own. • Wednesday’s Volunteer Night will feature these activities plus social media publishing and training! The fun begins at 6:30pm at campaign headquarters, 5018 Rainier Ave. S., Seattle, WA 98118. • Mark your calendar! 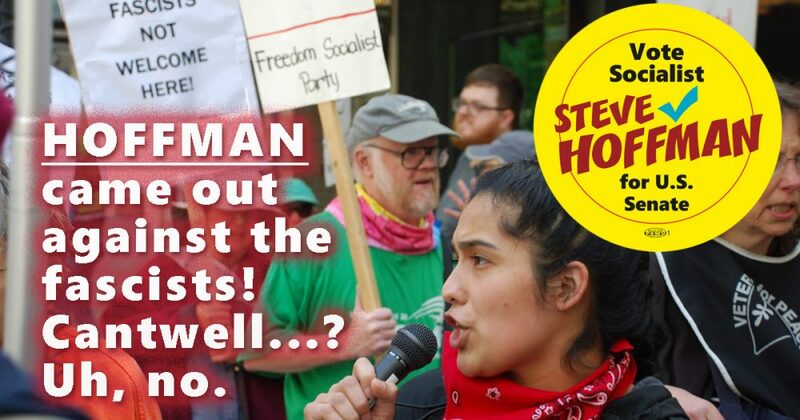 The Hoffman campaign will host a primary night party, Tuesday, August 7, 6:30pm, at campaign HQ, 5018 Rainier Ave. S., Seattle. Come relax as the first results are reported. Your contributions are keeping the campaign loud and visible. In these last weeks, we are emphasizing outreach and visibility, including some advertising. If you haven’t sent a donation in, please consider making one. Make checks payable to Advocates for Hoffman, mail to or drop off at 5018 Rainier Ave. S., Seattle, WA 98118.